Children will have hours of fun with the 15 projects in this beginner origami book, designed to introduce them to the exciting world of paper-folding. A crane, a bat, and a lotus-topped gift box are just a few of the simple projects for first-time paper folders. The book includes an introduction to origami that explores its history, the kinds of paper used, preparation, and basic folding techniques. Each of the projects explores a different aspect of Asian culture. 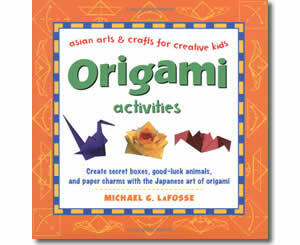 Origami is a wonderful way to stimulate a child's imagination and their interest in Asian art.